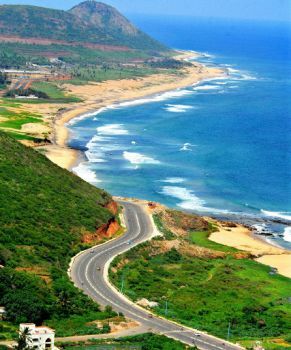 The beach with golden sand with coconut trees and blue water situated 25 kilometers from Visakhapatnam is ideal and safe for swimming, sunbathing and other beach activities and sports. Bheemunipatnam is certainly an excellent holiday spot to discover old Buddhist, Dutch and British culture in India. There is a lighthouse which was erected in 1868 on shores of Bheemili beach. A Christian church The Red Church is sited here along with The Andhra Baptist with historical background of over 130 years. The scenic beauty of confluence of Gosthani River with Bay of Bengal can be enjoyed from the hilltop temple of Lord Narasimha. Erra Matti Dibbalu or red earth hillocks resemble Chambal Valley. This place was once the settlements for Dutch in India and Hollanders Green was the graveyard for Dutchmen and also the oldest Christian burial ground in Andhra Pradesh.